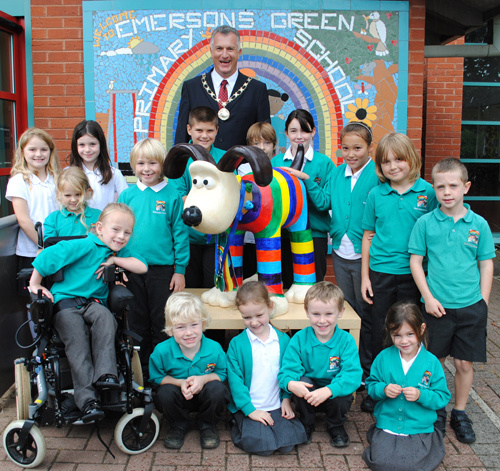 EMERSONS Green Primary School’s mini Gromit came out as top dog in South Gloucestershire in the summer’s highly successful charity arts trail. South Gloucestershire Council held a Facebook competition to find the most popular among the six full-sized and nine smaller Gromits, which were all decorated by primary pupils and put on display at various locations. Council chairman Ian Boulton visited Emersons Green Primary to congratulate the pupils on their winning design and to welcome back the Gromit after his visits to the Bristol & Bath Science Park at Emersons Green and the University of the West of England’s Frenchay campus.